Eating bananas with dessert spread can be a messy business. You can't exactly stick your bare banana in a tub of peanut butter, but spreading nutella from knife to fruit can be a hassle, too. Thankfully there are much smarter people than us in the world, and one of them may have just solved this banana problem once and for all. 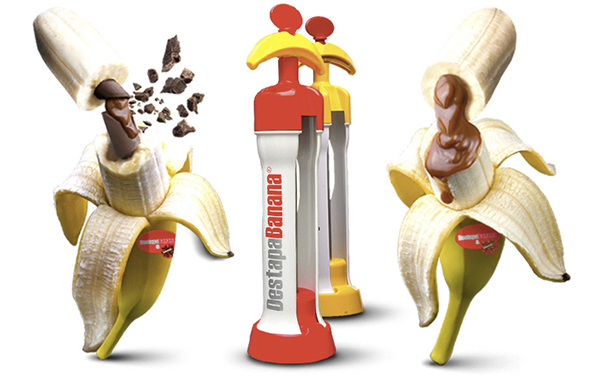 DestapaBanana is a new invention by Argentinian Sebastian Berger that allows you to core and then stuff unpeeled bananas with any liquify treat of your choosing. Basically a glorified syringe, but a really, really neat looking one. As demonstrated by the video below, all you need to do to use the Destapa (which means "uncork" in Spanish), is hold the device to the bottom end of an unpeeled banana, push the inner tube through to remove the core, and then inject as much sugar crack into the newly formed hole as you'd like. Current Destapa flavors include chocolate, dulce de leche, and fruit, though there's nothing stopping you from filling the tubes with peanut butter or nutella or marshmallow fluff too. Our money's on cinnamon, rum, and some vanilla ice cream. Yasss bananas foster stuffed bananas, yassss.